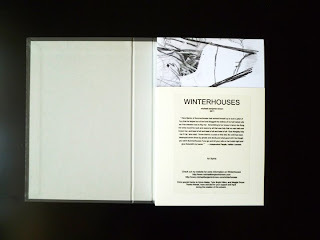 Please join us in celebrating the launch of WINTERHOUSES. Michael's artist book WINTERHOUSES is an 'unsequenced' group of 60 pages of images and language. Symbols ranging from: the scientific to the mythological, the numinous to the beautiful, and the mysterious to the matter-of-fact weave throughout the work, while changing form on any given page. Metamorphosing interpretation occurs through individual's random arrangements. Viewers might conjure narratives or simply a singular impression. WINTERHOUSES is an artist multiple. Hardcover, 60 pages, 2011. Drawings/ink paintings/photographs/written words/composites. Preview more of the project here. Michael Benjamin Brown is an interdisciplinary artist and MFA graduate from the Chelsea College of Art and Design in London, England. His work has been exhibited locally, nationally, and internationally. Michael is currently living and working in Wpg, MB.